Tavern Bimbo Pub is located at No 39 Bulevar Despota Stefana Street in downtown and represents real refreshment and mixture of pub and tavern. Tavern Bimbo Pub is opened during day as a pub from 9 am to 23 pm, while on Saturday night is opened for night out from 10 pm to 4 am. Management of this tavern is planing to open another two days for nigh fun. Tavern Bimbo Pub accommodates 90 people. As far as music program of tavern Bimbo Pub, accent is on pop, folk and traditional music that absolutely completes bohemian concept of this tavern. 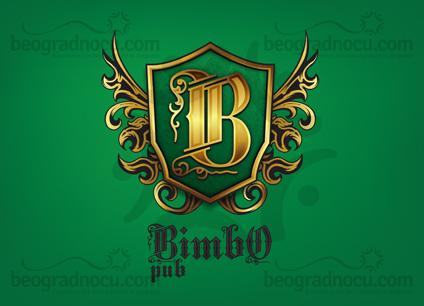 Guests of tavern Bimbo Pub are led with a fact that this tavern is ideal for concept of this type. When we talk about interior, tavern Bimbo Pub has plenty of green leather furniture which is true color of one pub. Whole tavern consists of ground floor and gallery and it's very spacious for all your dance moves. Wooden benches and plaid sheets are important detail of pub, as well as the wall decorated in natural brick and stone. Even though music genre in tavern Bimbo Pub is mostly pop, folk and traditional music, here you can here everything guest desire. And then emotions of guests awake, because honest song will always move you. Sure thing is that in tavern Bimbo Pub you will have an amazing time and you will not be disappointed. Whether you are spending casual time with your friends during a day or you dance all night. True hedonists that are spending time in tavern Bimbo Pub, because atmosphere is relaxed and interior is subordinated to your maximum pleasure. In tavern Bimbo Pub prices are very affordable sou here you don't have to worry about your wallet. One thing is for sure - tavern Bimbo Pub is ideal for relaxed fun and absolute enjoyment for all your senses. This is place where you will always return.